As the terror of Shadowbrook grows, the darkness spills into the neighbouring countryside. Strange creatures wander the roads at night and dark chanting can be heard from the hallowed halls of the Monastery. Masked figures move about in the shadows, pulling strings and making ready to complete rituals begun centuries ago. But not all that is new is evil. More travellers have arrived to quell the growing shadow and strengthen the resolve of the people, but have they come too late? A fog lays cold and dark over the mysterious Echo Lake, and the spirits and spectres grow restless now, for they know that something dark approaches. For Something Wicked this way comes! 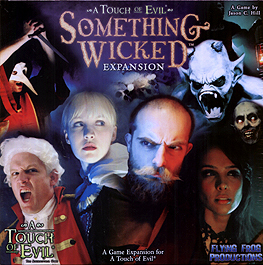 This product requires the A Touch of Evil board game to play.